Organizers for the 2018 Winter Olympics in PyeongChange are grappling with a large norovirus outbreak that's reportedly sidelined 1,200 security guards -- just days before the massive international event kicks off on Thursday. South Korean officials replaced the security guards with 900 military personnel as of Monday night, according to a report by CNN. The decision to send 1,200 security guards home in the immediate lead-up to the games was largely precautionary, and came after 41 guards were taken to the hospital after experiencing symptoms of diarrhea and vomiting on Sunday night. 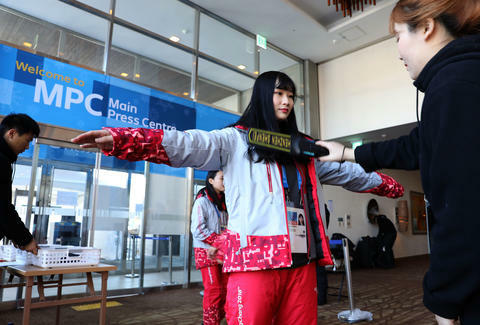 "The military personnel ... will be responsible for security checks of the 20 venues as they take up jobs such as security searches, previously done by civilian safety personnel, until the patients' condition is normalized," the PyeongChang Olympics Committee said in a statement. The U.S. Centers for Disease Control & Prevention (CDC) calls norovirus "very contagious." It spreads through contact with food, water, contaminated surfaces, or an infected person. Stomach cramps, diarrhea, nausea, and vomiting are all common symptoms. At last year's world athletics championship in London, a norovirus outbreak sidelined several athletes after the disease spread through a hotel, according to a report by Reuters. Organizers are moving quickly alongside Korean authorities to sanitize any area that's potentially been exposed. Dubi told reporters that hand sanitizers and leaflets explaining the dangers of norovirus will be distributed to people entering potentially compromised areas. The contagion comes as a severe cold snap threatens to make the PyeonChang games the coldest Winter Olympics in decades. As the temperatures have plummeted to below-21 degrees Celsius at night, spectators will be offered blankets, hot packs, seat warmers, and other accommodations to fend off the cold.